Clo-oose (tluu7uus in the Nuu-chah-nulth language) is a village of the Ditidaht people in the Canadian province of British Columbia. It is located just southwest of the west end of Nitinat Lake in Pacific Rim National Park Reserve on the west coast of Vancouver Island, about 65 kilometres (40 mi) south of Port Alberni. 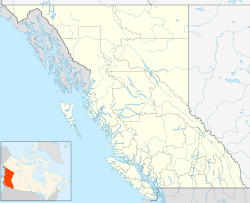 Its population is approximately 50 and consists of members of the Ditidaht First Nation. The village is located entirely on Claoose Indian Reserve No. 4 but the name refers to the locality beyond the reserve also, which has in the past had non-native residents. The name Clo-oose comes from the Nitinaht word 'tlu7uus which means "camping place." It is not clear when Clo-oose first became a permanent village. When the reserve was surveyed in 1892, there were seven houses and in 1906, John T. Walbran mentioned it by name in his book on British Columbia coast names: "Clo-oose, situated about a mile eastward of the entrance to Nitinat Lake, is ... the principal village in the neighbourhood". Prior to its establishment as a village, it served as a favourite resting spot for the native halibut fishermen. On 1 September 1911, the Clo-oose post office was opened and it served the community for nearly 55 years, finally closing on 11 August 1966. Canadian poet Marjorie Pickthall lived in Clo-oose in 1921-1922, and the community is mentioned in her poem, "The Sailor's Grave at Clo-oose, V.I.". ^ "Clo-oose (locality)". BC Geographical Names. This page was last edited on 10 August 2017, at 04:15 (UTC).